He added that islands in the Persian Gulf act as “aircraft carriers” for helicopters which take off and land on them. 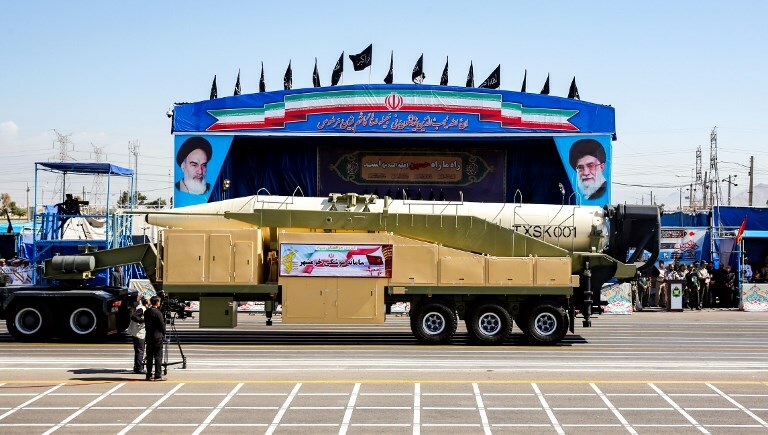 Iran’s missile capabilities and its ongoing development program has been a major source of tension with the West, particularly with the United States. US President Donald Trump, who pulled out of the 2015 nuclear deal with Iran and world powers in May, has called for a new agreement that restricts Iran’s missile capabilities and regional interventions. Last month, the Trump administration began reinstating economic sanctions against Iran that were eased in exchange for concessions on Iran’s nuclear program in the nuclear agreement, known as the Joint Comprehensive Plan of Action. The UK, France, Russia, China, Germany, and the European Union, which also signed the deal, have criticized Trump’s decision and continue to back the agreement with Iran. Also last month, Tehran unveiled a next-generation short-range ballistic Fateh missile, and vowed to further boost its capabilities. The new missile’s range was not given, but previous versions of the Fateh had a range of around 200 to 300 kilometers (125-185 miles), according to the US-based Center for Strategic and International Studies. “As promised to our dear people, we will not spare any effort to increase the missile capabilities of the country and we will certainly increase our missile power every day,” Iranian Defense Minister Amir Hatami said at the time. Earlier this week, Israeli Prime Minister Benjamin Netanyahu revealedwhat he said were precision missile sites hidden in Beirut by Iranian-proxy and Lebanese terror group Hezbollah. Speaking at the UN General Assembly on Thursday, Netanyahu also revealed what he said was a previously unknown Iranian nuclear site, saying it could contain up to 300 tons of nuclear material. He accused the International Atomic Energy Agency of failing to investigate findings that he presented earlier this year about Iran’s nuclear program. “Hezbollah is deliberately using the innocent people of Beirut as human shields. They have placed three of these missile conversion sites alongside Beirut’s international airport,” he added. This entry was posted on September 30, 2018 at 7:32 AM and is filed under Uncategorized. You can subscribe via RSS 2.0 feed to this post's comments. You can skip to the end and leave a response. Pinging is currently not allowed.